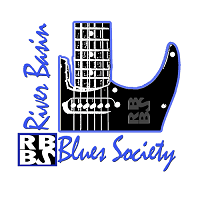 The River Basin Blues Society monthly meetings are held the second Monday of the month unless the time and location is changed in advance. It begins at 6:30 pm and is held at Lamasco Bar & Grill. 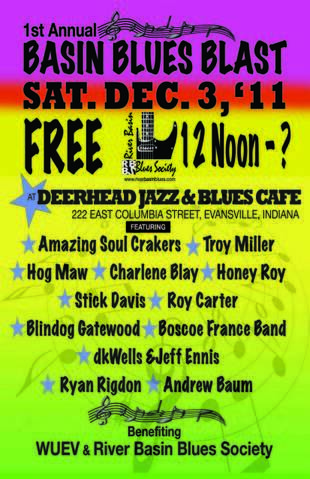 The 1st Annual Basin Blues Blast was held on Saturday, December 3, 2011, at the Deerhead Sidewalk Cafe. It was the first real public event for the Society. 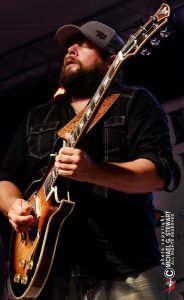 The acts participating were Troy Miller, Hog Maw, Charlene Blay, Jeff “Stick” Davis, Honey Roy, The Amazing Soul Crackers, Roy Carter, Blind Dog Gatewood, Boscoe France, Ryan Rigdon, Andrew Baum, and dk Wells & Jeff Ennis. It was a fundraiser for the River Basin Blues Society and WUEV 91.5 FM. The Deerhead began the tradition of giving a percentage of their daily gross for the fundraiser. 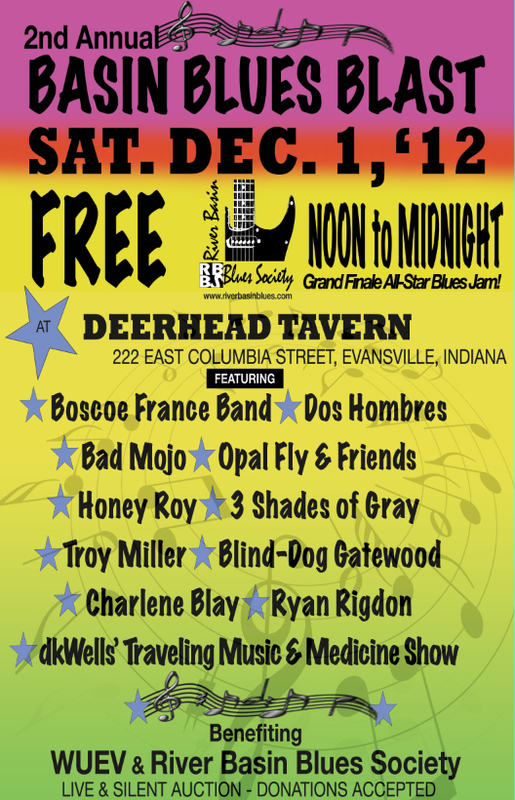 The 2nd Annual Basin Blues Blast was held on Saturday, December 1, 2012, at the Deerhead Sidewalk Cafe. The afternoon featured the following acts: Ryan Rigdon, Charlene Blay, Boscoe France Band, Dos Hombres, Opal Fly & Friends, Honey Roy, 3 Shades of Gray, Troy Miller, Blind Dog Gatewood, and DK Wells. There was a live and silent auction and the monies were divided between the River Basin Blues Society and WUEV 91.5 FM. 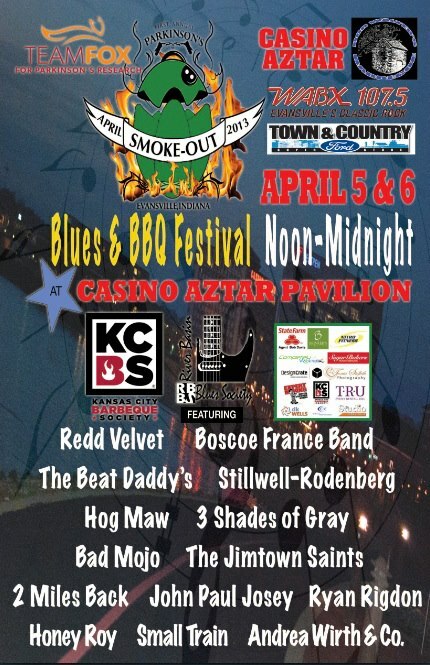 The River Basin Blues Society partnered with Bob Morphew for the first Smoke Out Barbecue and Blues Festival. It was held along Riverside Drive in Downtown Evansville, with the entertainment at the Casino Aztar Pavilion on Friday, April 5, and Saturday, April 6, 2013. This was a rather large gathering of cooking outfits, most affiliated with the Kansas City BBQ Society. A major benefactor of this event was Team Fox, which raised money in the name of actor Michael J. Fox for Parkinson’s research. The acts featured over the two days were: Redd Velvet, Boscoe France, the Beat Daddys, Stillwell/Rodenberg and Friends, Hog Maw, 3 Shades of Gray, Bad Mojo, the Jimtown Saints, 2 Miles Back, John Paul Josey, Ryan Rigdon, Honey Roy, and Andrea Wirth. The 2013 Old Dam Blue and BBQ Festival was held on Saturday, August 10, 2013, at the Old Lock and Dam Park in Newburgh, IN. 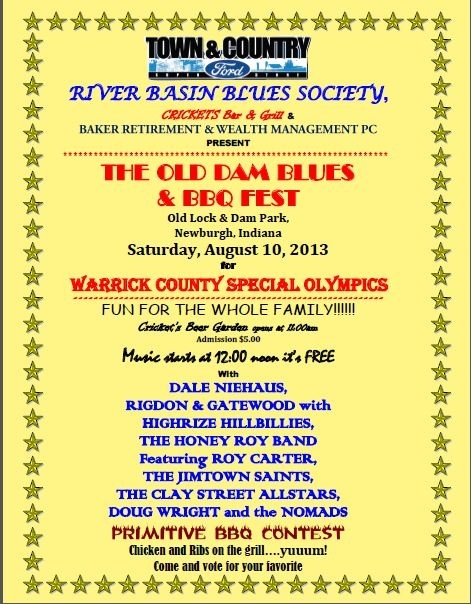 The River Basin Blues Society partnered with the Warrick County Special Olympics for this event. There was a BBQ contest with the winner being crowned by popular vote. There was a tented beer garden, sponsored by Cricket’s Bar & Grill. The acts that played at this event were as follows: Dale Niehaus, with a Special Olympian, Leland Isbill sitting in on harmonica. Ryan Rigdon and Blind Dog Gatewood with the Hi Rize Hillbillies, Honey Roy fea. Roy Carter, the Jimtown Saints, the Clay Street All Stars, and Doug Wright and the Nomads (the last two acts were from Louisville, KY). The 2013 Basin Blues Blast was held at the Deerhead Sidewalk Cafe on Saturday, December 14, 2013. There was a live auction featuring local art. The bands playing were the following: Rigdon/Gatewood & the Hi Rize Hillbillies, Dale Niehaus & Friends, Hog Maw, Honey Roy, featuring Roy Carter (sax) Charlene Blay (vocals), Jesse Sellers (vocals, guitar), and Opal Fly (sax, vocals). Also featured were the Beat Daddy, the Jimtown Saints, and Sad Sam Blues Jam. Sad Sam was the IBC Youth entry from Bloomington, IN. 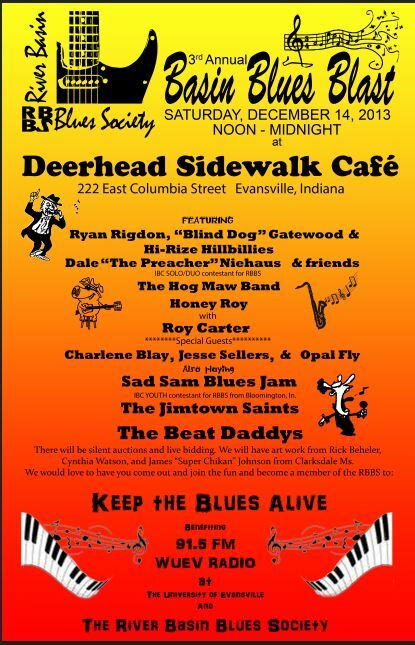 The 4th Annual Blues Blast was held at Deerhead Sidewalk Cafe on Saturday, November 29, 2014. 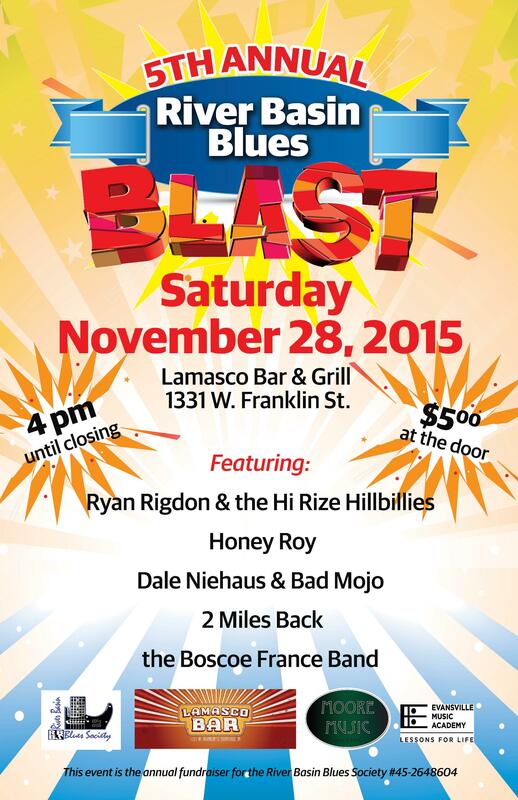 This was the first blues blast that was held the Saturday after Thanksgiving. There was a auction of items from various sources, with a highlight on the Cynthia Watson portrait of Roy Carter. 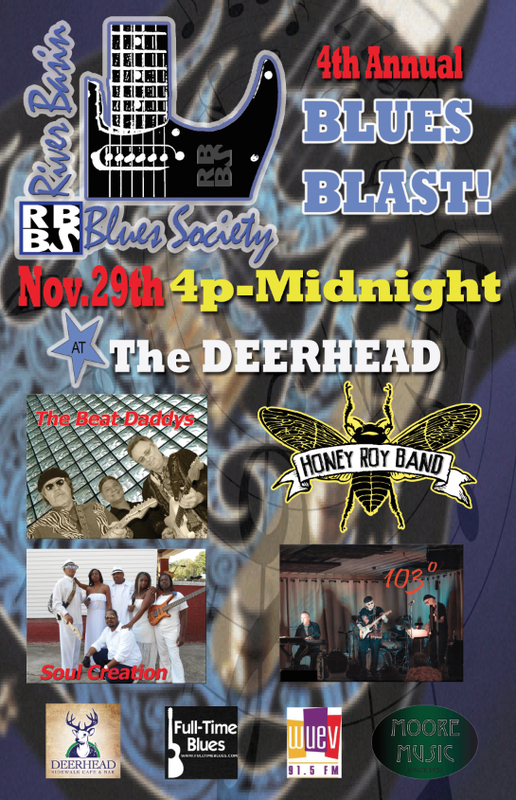 The bands for this (the last held at Deerhead) were 103 Degrees, Honey Roy, Soul Creation, and the Beat Daddys. The PA was gleaned together by Paul Mattingly, w/ Adam Scholfield running it. The 2015 Fan Appreciation Day was held on Sunday, June 28, 2015, at Lamasco Bar and Grill. 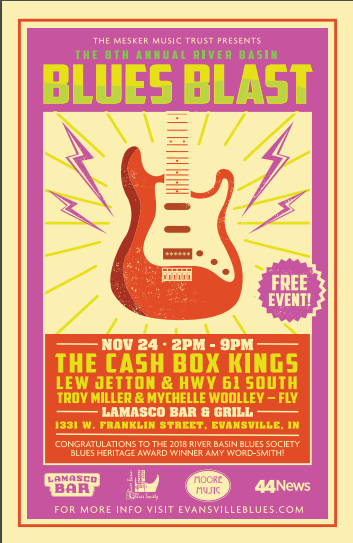 This was the first River Basin Blues Society event at Lamasco. Lamasco became the home of the Society. 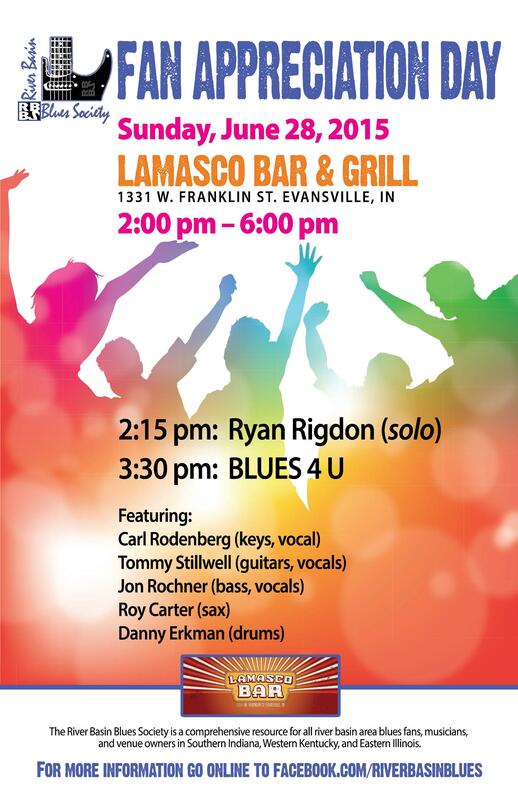 This was an afternoon event featuring Ryan Rigdon as a solo act and Blues 4 U. This group featured Carl Rodneberg (keys, vocals), Tommy Stillwell (guitar, vocals), Roy Carter (sax), Jon Rochner (bass), and Danny Erkman (drums). 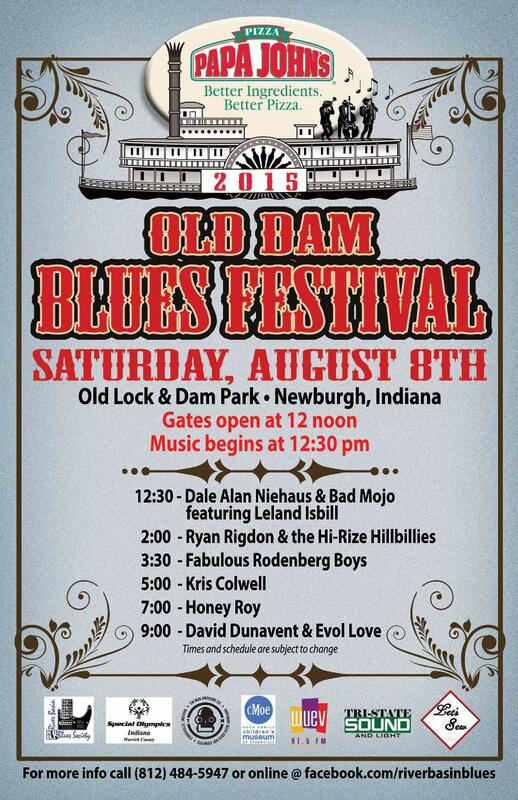 The 2015 Old Dam Blues Festival took place at the Old Lock and Dam Park in Newburgh, In on Saturday, August 8th. This was the second event at this location, although there was a year in between the first and second event. 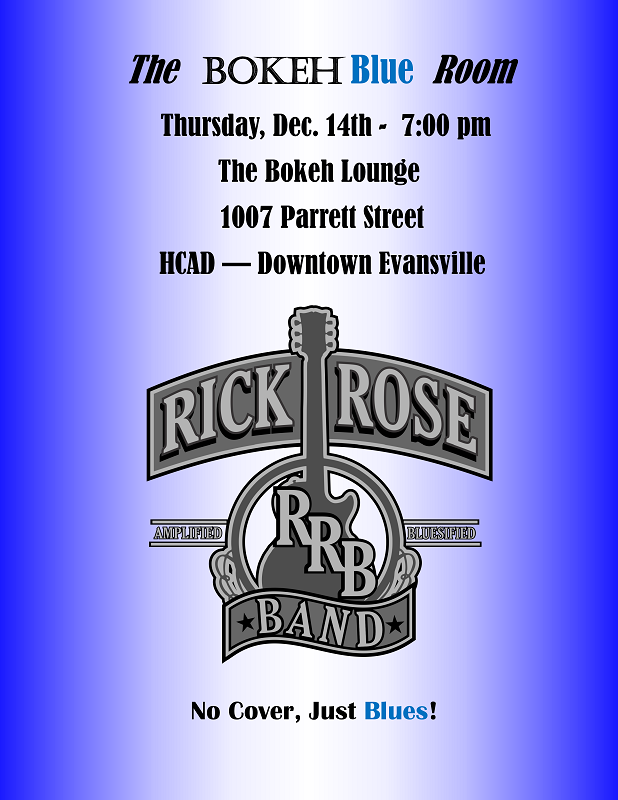 As was the first event, the River Basin Blues Society partnered with the Warrick County Special Olympics. The beer garden was sponsored by Tin Man Brewing Company. There were children activities sponsored by cMOE, Art Woodard (Art the Dude) harmonica workshop, and inflatable attractions. Along with a host of local sponsors, the presenting sponsor was Papa’s John Pizza. Moore Music continued their generous support with a common drum kit. The acts appearing for this day-long event were Dale Niehaus & Bad Mojo featuring Leland Isbill. 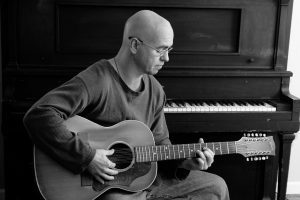 Leland is a Special Olympian who has become known as a talented harmonica throughout the blues world. Ryan Rigdon & the Hi Rize Hillbillies and the Fabulous Rodenberg Boys followed and then Kris “Mudbone” Colwell took the stage as a solo act. Honey Roy and David Dunaent & Evol Love finished the day. 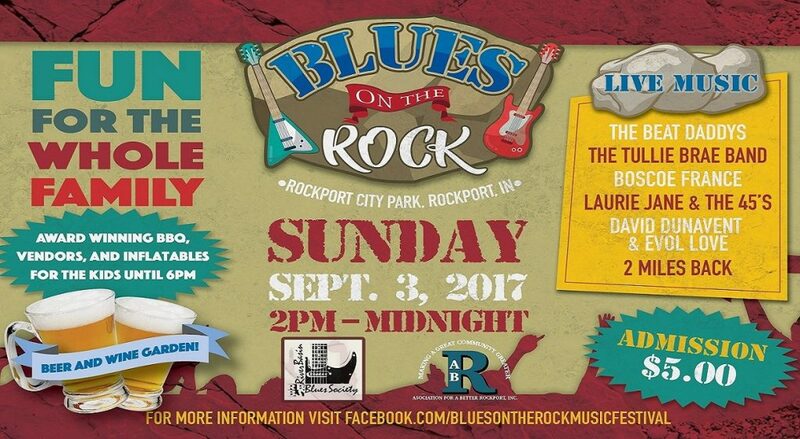 Sunday, September 6, 2015, saw the Society partner with the Rockport City Parks Board (RCPB) for the 1st Annual Blues on the Rock Blues Festival. 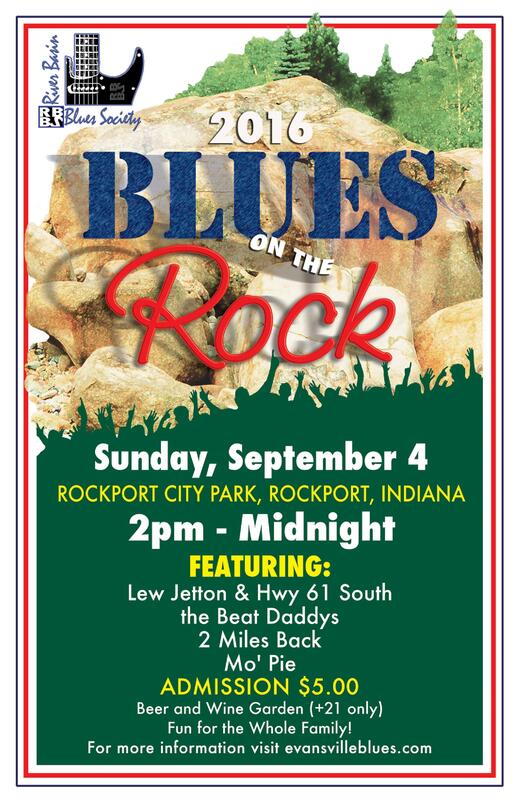 This event was held at the Rockport City Park in Rockport, IN. The city park has a stage and provided an effective area for a fine afternoon of blues. Tin Man Brewing Company continued its relationship with the Society by sponsoring the beer garden for this event. Tri-State Sound and Light continued to be the stage . production provider for the River Basin Blues Society. 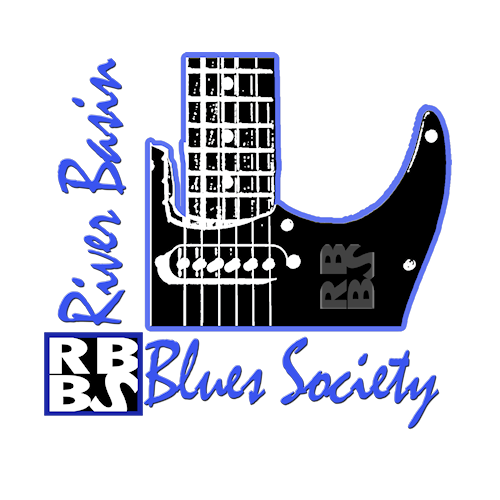 Event t-shirts were provided by the RCPB and Blues Society hats were also available. Blind Dog Gatewood began the event with a solo act with a great blues act from Louisville, Laurie Jane & the 45s coming up next. 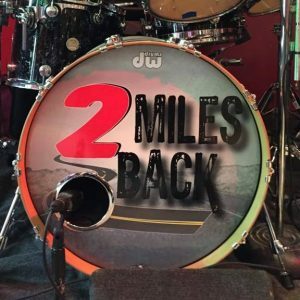 2 Miles Back brought their southern rock with a twist of blues to the stage and after that, Lew Jetton & Hwy 61 South from came up from Paducah, KY and rock the house. Ending the evening was the ever-popular Beat Daddys. 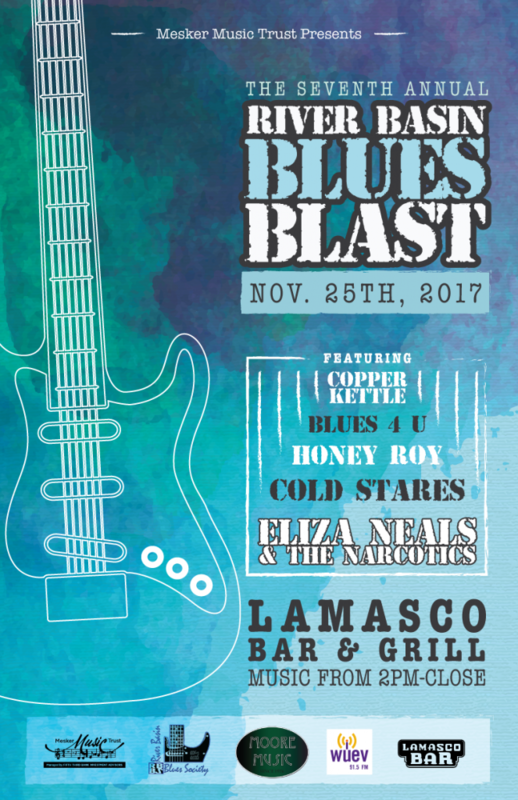 The 5th Annual River Basin Blues Blast was held for the first time at Lamasco Bar & Grill on Saturday, November 28, 2015. There was a silent auction featuring a signed guitar from Paul Reed Smith provided by Moore Music. Moore Music also provide the common drum kit. Cover was taken at the door from the beginning of the event until 9 pm that supported the River Basin Blues Society. The Society provide the funds for all the bands and Lamasco provided the funds for the headliner, the Boscoe France Band. Beginning the event was Ryan Rigdon & the Hi Rize Hillbillies with the rest of the day featuring Honey Roy, Dale Niehaus & Bad Mojo, and 2 Miles Back. 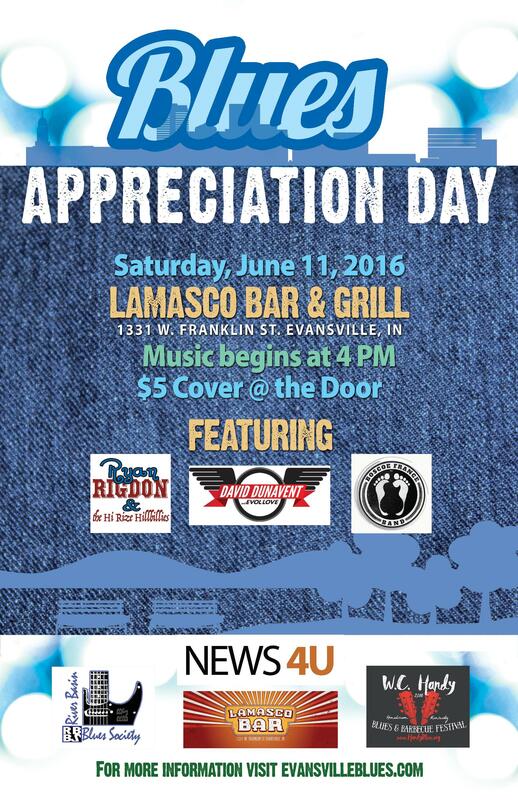 The Blues Appreciation Day was held on Saturday, June 11, 2016, at Lamasco Bar & Grill. 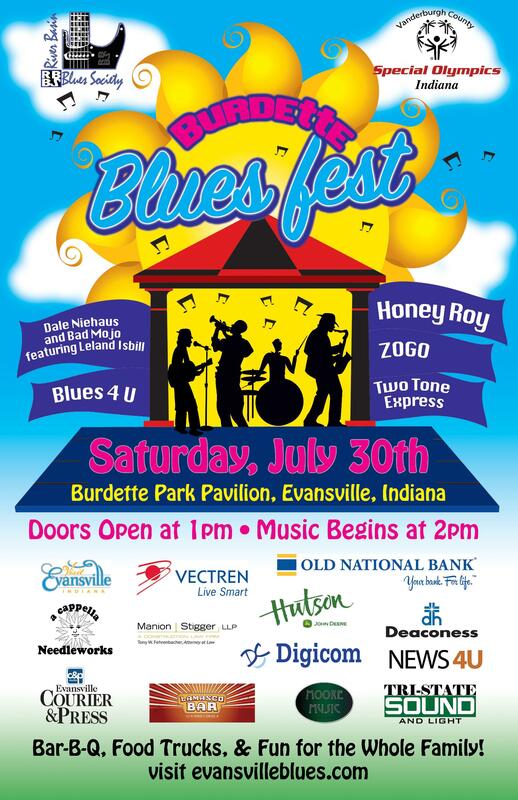 Sponsors for this event included NEWs 4 U and the WC Handy Blues and Barbecue Festival. Funds for this event were provided, in part, by the WC Handy Festival Committee. Cover was once again taken from the beginning of the event until 9 pm. 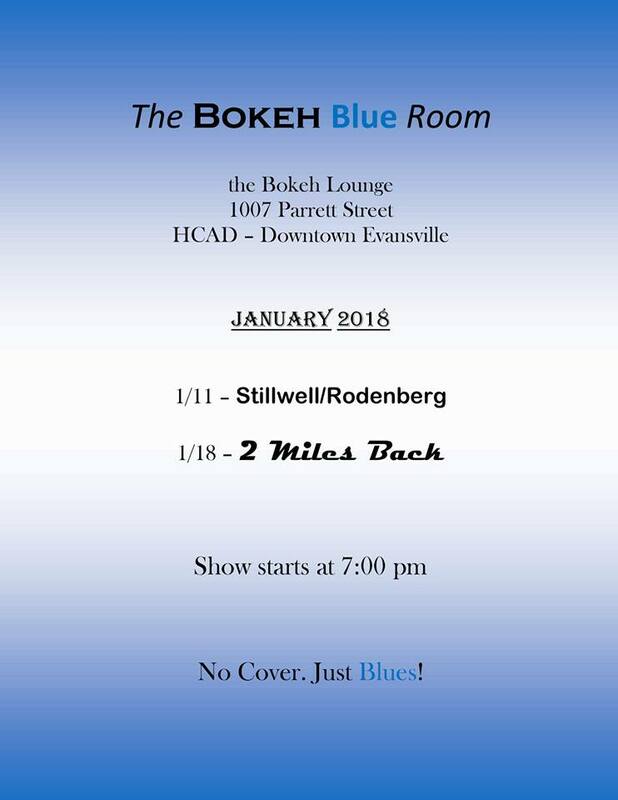 The day featured great blues by Ryan Rigdon & the Hi Rize Hillbillies, David Dunavent & Evol Love, and the Boscoe France Band. 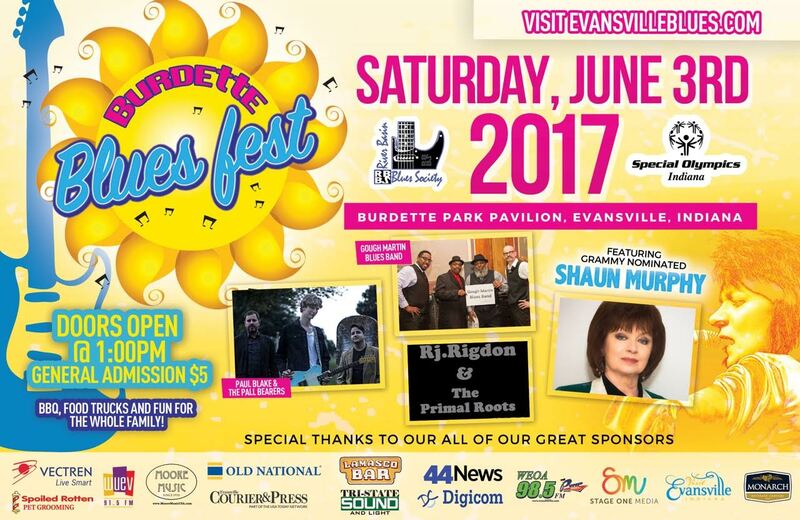 This event also premiered the new website, evansvilleblues.com. The 1st Annual Burdett Blues Festival was held at the Burdette park Pavilion at Burdette park in Evansville, IN. (This event was the signature Society summer event and replaced the events at the Old Lock and Dam Park in Newburgh, IN.) The title sponsor was the Evansville Convention and Visitor Bureau. This event was held at the pavilion which provided cover and staging and a temperate place for a summer event. There were food vendors and a VIP area for the sponsors. The Blues Society continued its relationship with the Special Olympics, partnering with the Vanderburgh County Special Olympics. The bands included Dale Niehaus & Bad Mojo featuring Leland Isbill, Blues 4 U, Honey Roy, Zogo, and the Two Tone Express. Moore Music provided the common drum kit and Tri-State Sound and Light provided the stage production. 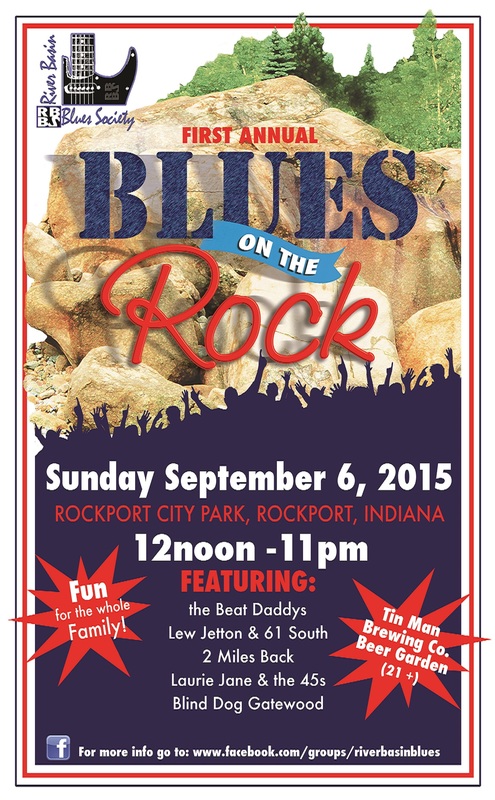 The 2nd Annual Blues on the Rock Blues Festival was held at the Rockport City Park in Rockport, IN. This year the vendors had more of a local flavor with McKenzie’s and Pepper Ridge Winery the beer and wine garden. The bands for this year were Mo’Pie, 2 Miles Back, the Beat Daddys, and Lew Jetton & Hwy 61 South. 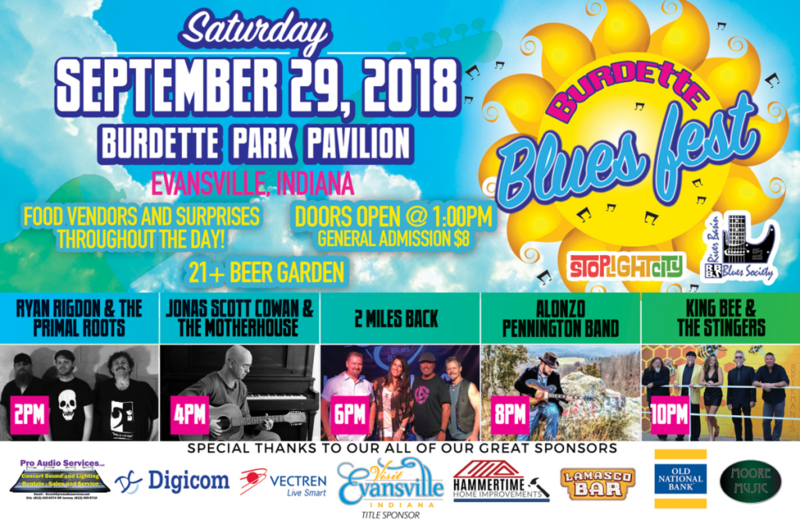 Once again, the Blues Society assisted in booking the bands and with promotion and received the general admission at the gate . 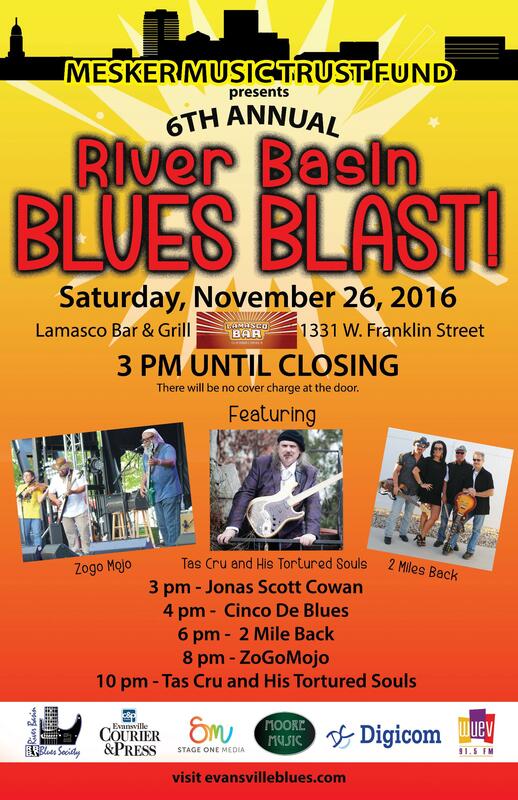 The 6th Annual River Basin Blues Blast was held at Lamasco Bar & Grill on Saturday, November 26, 2016. 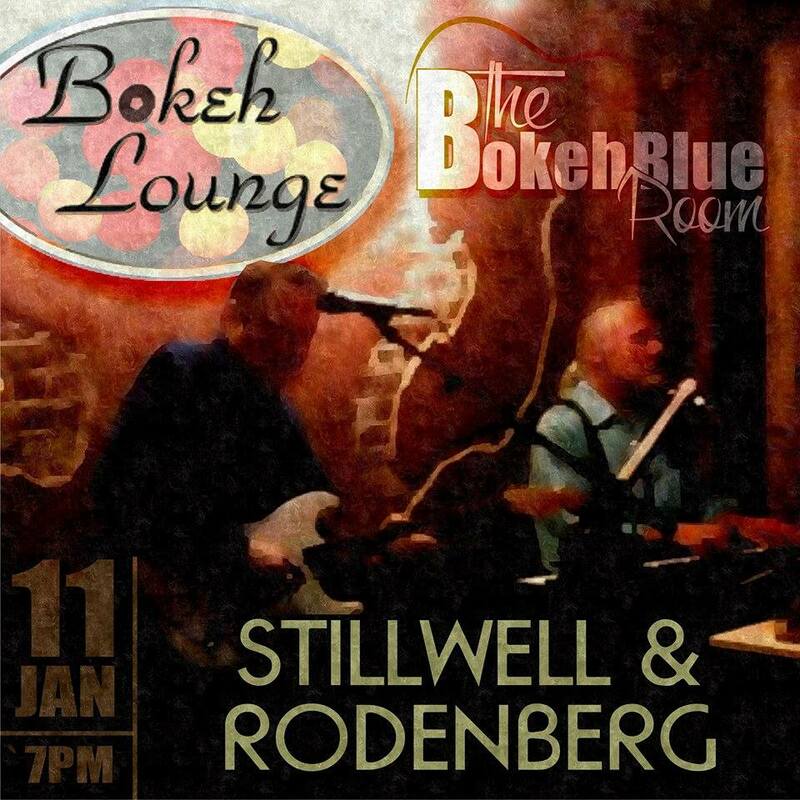 This event was subsidized by a grant from the Mesker Music Trust. This grant made it possible for it to be free and open to the public. Families were welcomed until 8:30 pm. The event opened with Jonas Scott Cowan as a solo, with Cinco De Blues bringing a great harp band to the stage. 2 Miles Back came up next with ZogoMojo bringing great R&B from Madisonville, KY. The headliner was the fine touring blues group, Tas Cru & His Tortured Souls. The Society was able to generate revenue from half pots and donations, along with some membership renewals. The Evansville Courier and Press provide newspaper coverage and advertisement. Moore Music provided a common drum kit for the event.